Dare to venture into yoga acrobatics - solo or with your acro buddy! 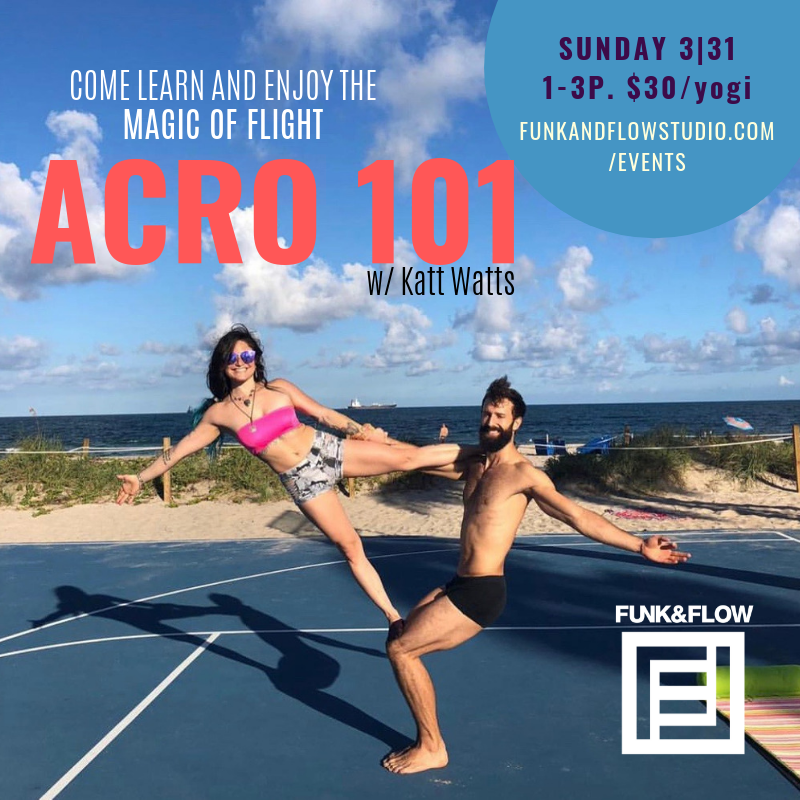 Whether a seasoned yogi or a newbie, this workshop will teach you the magic of flight! You’ll learn the three main positions of Acro, different contact points and techniques. Katt will cover an array of Beginner Acro Moves as well as incorporating the healing, therapeutic nature when Acro meets Thai Massage. You’ll gain confidence to fly or base and feel amazing on the Mat or in the Air! Again, no partner necessary. $30; ONLY 12 SPACES FOR HOOP-QUEENS AVAILABLE. Kindly register soon to save your space! Hoops will also be available for purchase! Learn the basics of Hooping in Hoop Dance 101 Workshop ! In this fun and energy-filled workshop, you will learn the 10 basic moves to begin your Hoop Dance journey! Each skill will be taught individually. After learning the basics behind these moves we will learn how to put them together to create a flow session. Each skill is taught in a way that ALL-LEVELS of Hoopers will be able to participate. You will gain confidence in your movements and learn both how to do tricks and use your hoop as a dance partner. Hand crafted hoops provided for use and also available for purchase! 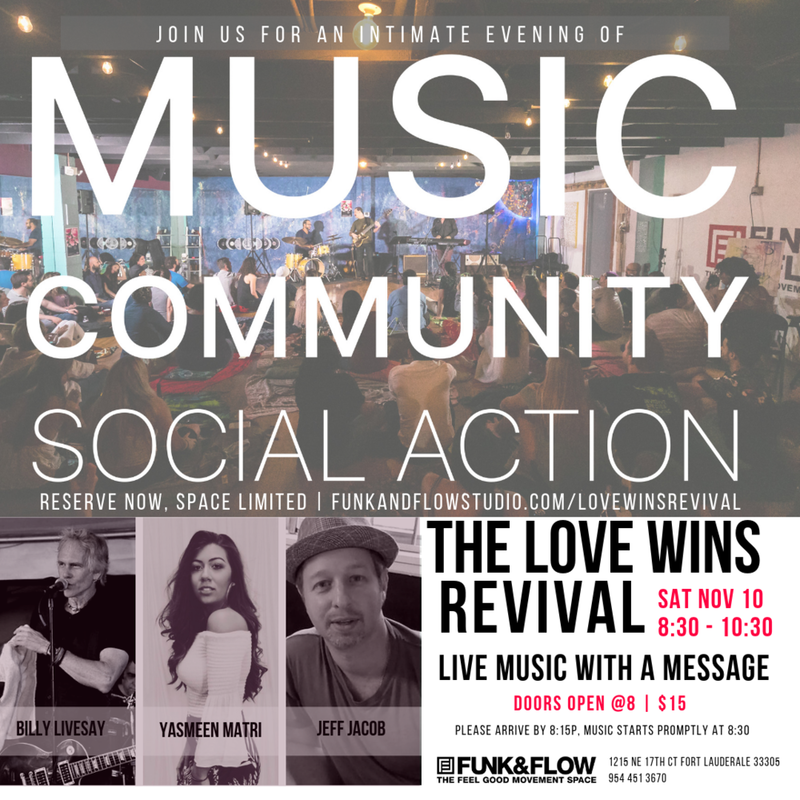 Join us Sat Dec 22 for a jolly filled evening with your feel good community! We'll mingle in merriment, enjoy drinks and treats and LIVE JAMS by our fav Tasty Vibrations! 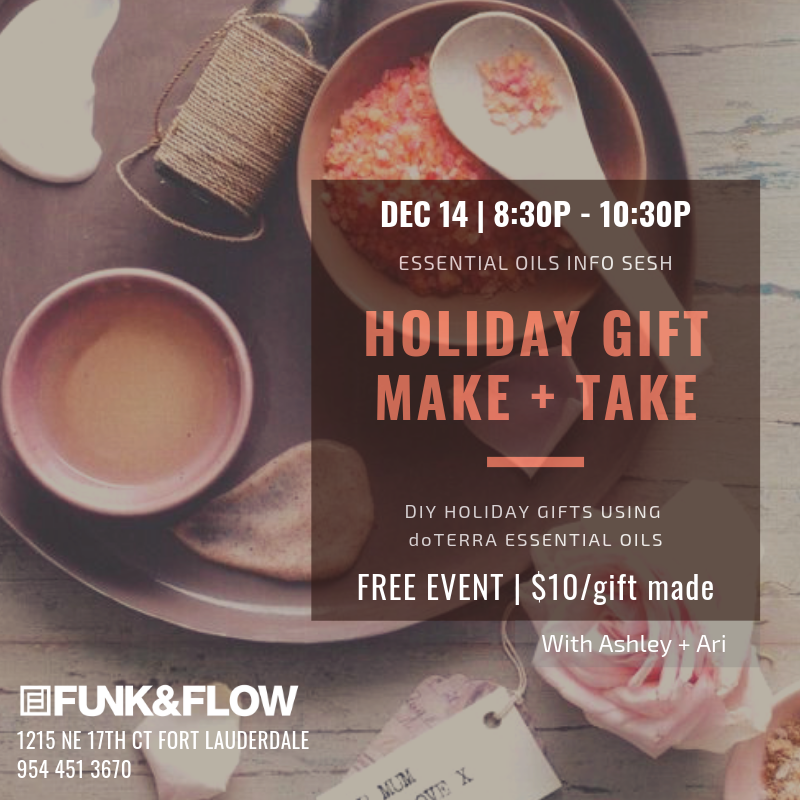 DIY holiday gifts are a great way to connect with oils and share these powerful tools with friends and family this holiday season! PUT ON YOUR BOOGIE SHOES AND JOIN US FOR ONE SPICY EVE! Our monthly Salsa Social is for EVERYONE - from the never-before dancer to the seasoned Salsero/a! The wonderful Hervin & Oana of Latin Dance Movement will lead with a 45-min introductory salsa class. The floor is yours for the rest of the evening to practice and enjoy salsa dancing. *Experienced dancers are welcome and encouraged to share their gifts with others. Casual dress, any shoes except flip-flops! Cindy has professional training and experience in dance, teaching, and athletic training. For ballet and modern dance she conveys to each student good, traditional technique and discipline. 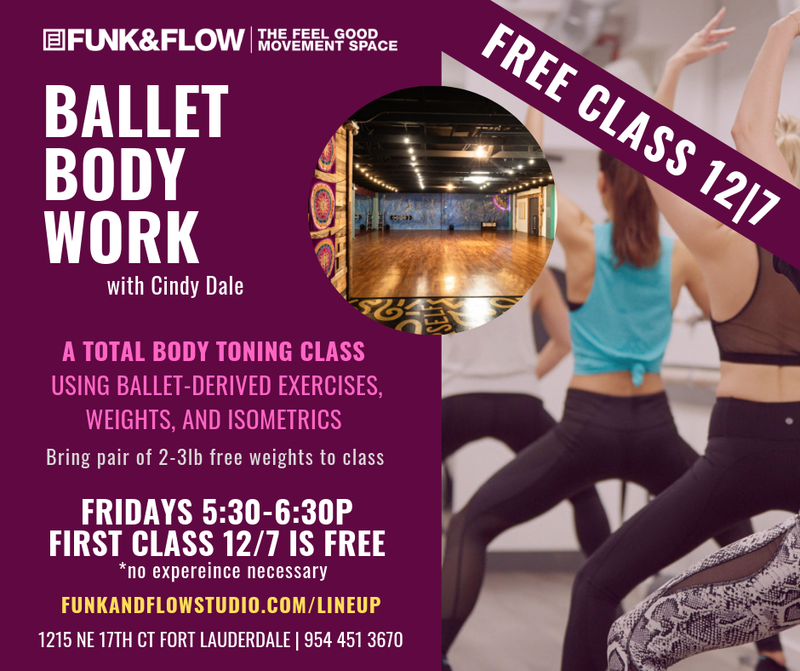 In her Barre / Body Work classes, she provides performance, strength, and cardio measures. Cindy’s overall objectives for Ballet Body Work are to help individuals build a knowledge of movement, have lean and strong physical being, a positive outlook on their bodies and a fabulous spirit of life. MINGLE WITH YOUR CURRENT OR FUTURE FUNK FAM. BRING YOUR MAT. BRING YOUR SNEAKS. Pre-Registration not needed. Show up Saturday and we will register you. 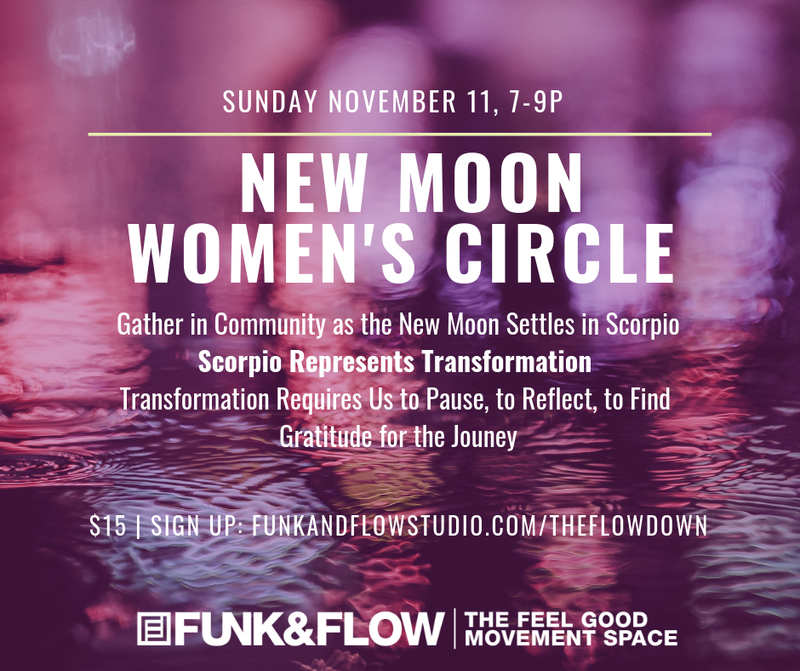 This Women's Circle will be a time to gather in community as the new moon settles in Scorpio. Scorpio represents transformation. Transformation requires us to pause, to reflect, and to find gratitude for the journey. In our world of constant doing and going, there is little room for being. We are creative beings desiring change and growth in all avenues of our lives, and yet we may not take the time to tap into that creative life force within us to allow the seeds we plant to blossom. In this ceremony, you will be guided through a reflective meditation to honor the transformation within you and tap into that creative life force for continued transformation within you and in our world. We will participate in a guided gratitude practice to set intentions for the next month especially as we enter into the holiday season. There will be time for each person to reflect and share with each other as this is a participatory and experiential circle for connection and personal growth. 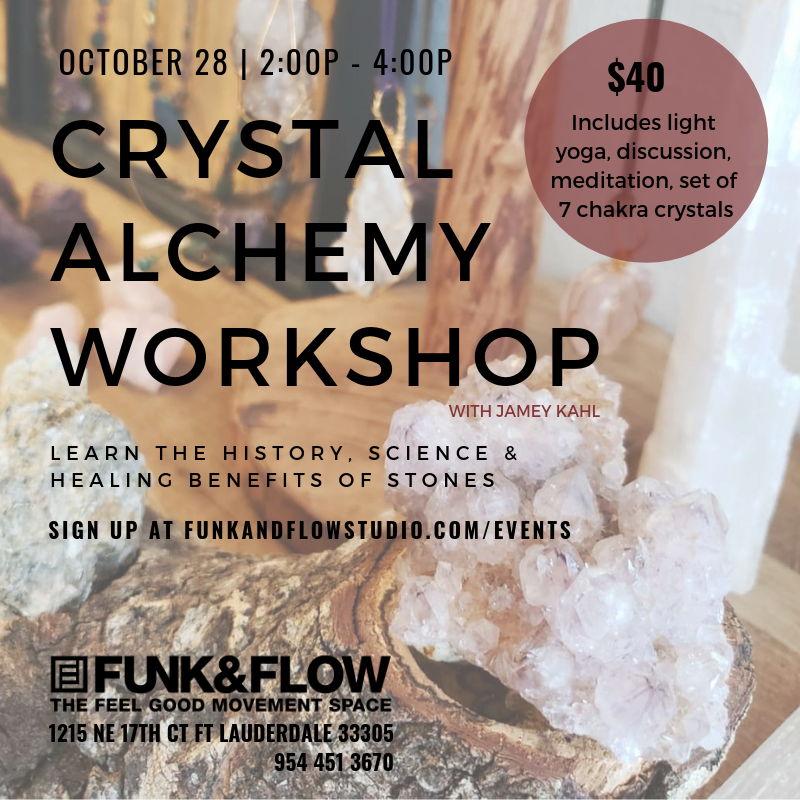 Join Jamey Kahl from Wheelhouse Arts to learn about the fundamentals of crystals and their many uses for healing, meditation, and manifestation. Jamey will guide discussion on the history & science behind crystals, the seven chakras and corresponding stones, cleansing practices, and meditation techniques that can assist in energy healing. Crystal Alchemy will include light yoga practice, discussion and meditation. Jamey will also gift you a full set of 7 chakra crystals. Doors Open at 7. Class begins at 7:30. (off A1A - same street as Casablanca restaurant). *meter parking or in lot across the studio. 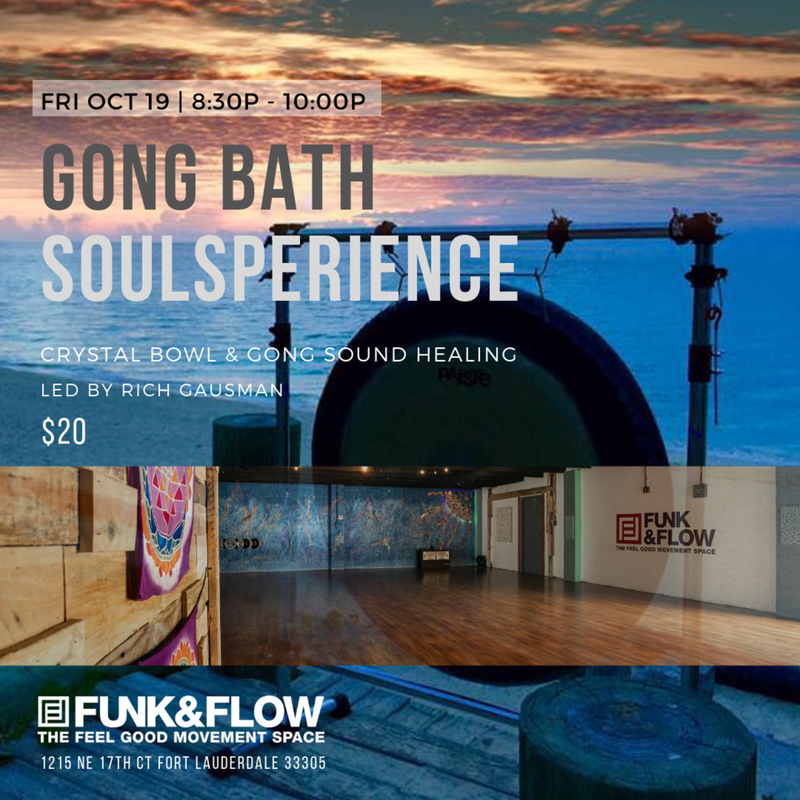 Join us for a magical evening of movement, relaxation, and all around feel good vibrations amid the salty air, under the stars! A 75-min Feel Good Flow begins at 7:30, ending with 30-min Drum Bath Shivasana. We'll be hanging and connecting on the Rooftop until 10p, light refreshments will be provided. It is your birthright to tap into your own divine wisdom. Gong & Crystal Bowl Sound Therapy resonate on a cellular level within the body, creating benefits for the: mind, nervous system, energy meridians, and functionality of the glandular system. Our thirty-trillion cells take on a dance, vibrating in patterns that release energy blockages and stimulate circulation, allowing for a free cosmic flow within the body. Experience emotional transformation, chakra balancing, mental clarity, and a pure relaxation that breeds harmony, good health, and happiness. Bring a mat, cushion or blanket to lie on. mats avail in studio but are limited. Come as you are and receive. EMBODY is welcoming of your feminine expressions and movement explorations. This class is freeing and empowering. You will ride the beats of soul-fulfilling rhythms, encouraging you to bask in your personal dance - no critique, no choreography - just your soul on fire. Join Nicole Xiques, creator of the "The Unguarded Heart" for EMBODY - a women's only dance-movement class that allows you space to just be YOU. COMPLIMENTARY COFFEE AND BITES BY LOCALLY LOVED STORKS BAKERY & CAFE. AAF CreativeZen was born out of a desire for the local AAF Greater Fort Lauderdale & the Palm Beaches chapter of the American Advertising Federation & Choose954 to inspire and engage with our local creative community. Every Creative Zen event includes coffee and breakfast bites before a short inspiring and thought provoking talk during the second Friday morning of the month. All levels welcome. $25, register below. 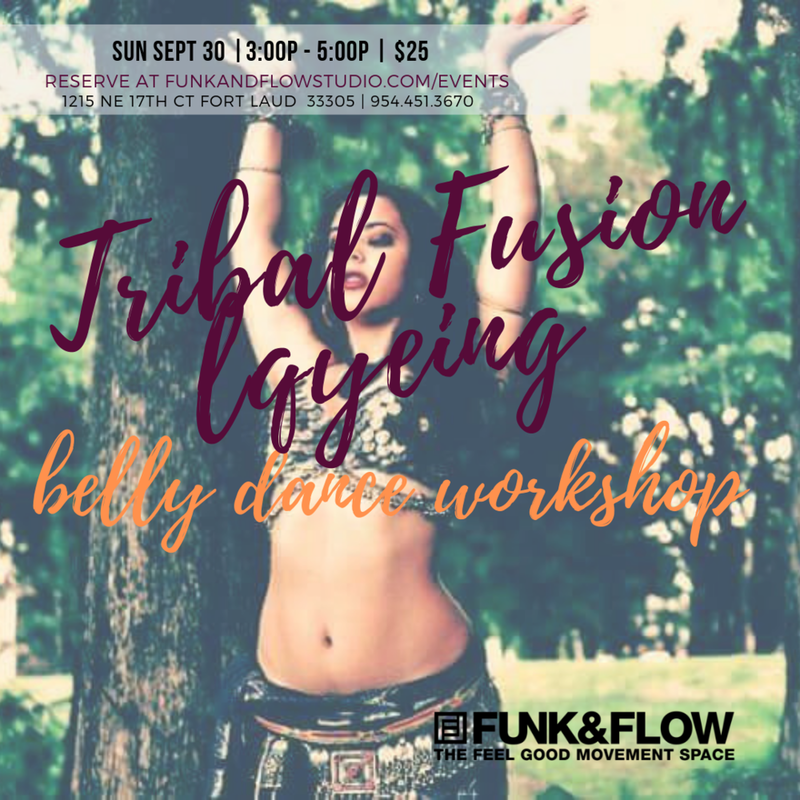 An exploration of earthy & modern movements of Tribal Belly Dance alongside classical oriental concepts. This workshop will teach manipulation and isolation of various body parts and how to conduct these movements simultaneously. Alex will guide dancers through sharp and fluid isolations, eventually blending them in a way that feels seamless. Prepare to explore your sultry spirit through gritty, genre-bending music and express your dance from a place deep within. Sound Healing is an ancient form of therapy that highly benefits us modern-world dwellers. Professional Percussionist Alan Reyna practices empowerment drumming and serves the community through Healing Drumming, a blend of low frequency drums, percussion, and Buddhist Mantras. Frequencies comprised of continuous healing vibrations travel throughout the air and resonate within the body on a cellular level. The vibrations engage with our energy meridians, and glandular and nervous systems to release energy blockages and stimulate circulation. Experience a chakra balancing, emotional transformative, mind-clearing, pure state of relaxation that breeds harmony, good health, and happiness. Bring a mat, cushion or blanket to lie on. Mats available in studio, but are limited. **sessions typically run for 4 weeks time. Due to Labor Day Wknd, this session will run for 5 Saturdays. Class 8/25 will be repeated on 9/1; therefore, enjoy a free class with your swing set or attend one of the first two classes. The Lindy Hop - also called "The Lindy" - is a partner dance dubbed the most versatile of the vintage Jazz dances, with roots in 1920s and 30s Harlem. Simple and super fun to learn, The Lindy consists of both 6- and 8- count steps with borrowed footwork from Tap Dance and The Charleston. "The Lindy" is both fast and frenzied, and smooth and sophisticated. The Intro to Lindy Swing Set is perfect for those new to swing dancing. Expect to learn basic rhythms and cool moves that will take you from the classroom to any "Swing night out!" The Level One Lindy Swing Set is perfect for those who have completed the Intro Class or are familiar with a "swing out." You will learn how to fuse Charleston with Lindy Hop and increase your rhythmic and movement skills to be an all-around dynamic swing dancer. Choose a Single or Swing Set and Select your Class (Intro or Level One) at Checkout. Alan Reyna is a professional percussionist who hails from Caracas, Venezuela and resides in Miami, Florida. He started playing drums at 12 and his passion for playing drums has been growing until today. Alan has toured extensively and performed with artist such as Grammy winner Jorge Moreno, two times nominated for American and Latin Grammy Locos Por Juana among other artists. In 2007 Alan started teaching drums in schools across South Florida and has sponsored drum circles in both recreation and corporate settings. He has facilitated a Team Building and Stress Reduction circle for the Educe Group and for the teachers of Morningside Montessori, KLA schools, among others. Alan has become a trained Health Rhythms facilitator. He was trained by Neurologist, Dr. Barrry Bittman, MD, and Christine Stevens, MSW, MT-BC, MA. After this training, he created Drumbelievable Rhythm Makers. He has determined to be a channel to help people to be happier,reduce stress, and to nurture them with positivity, embracing their wellbeing. 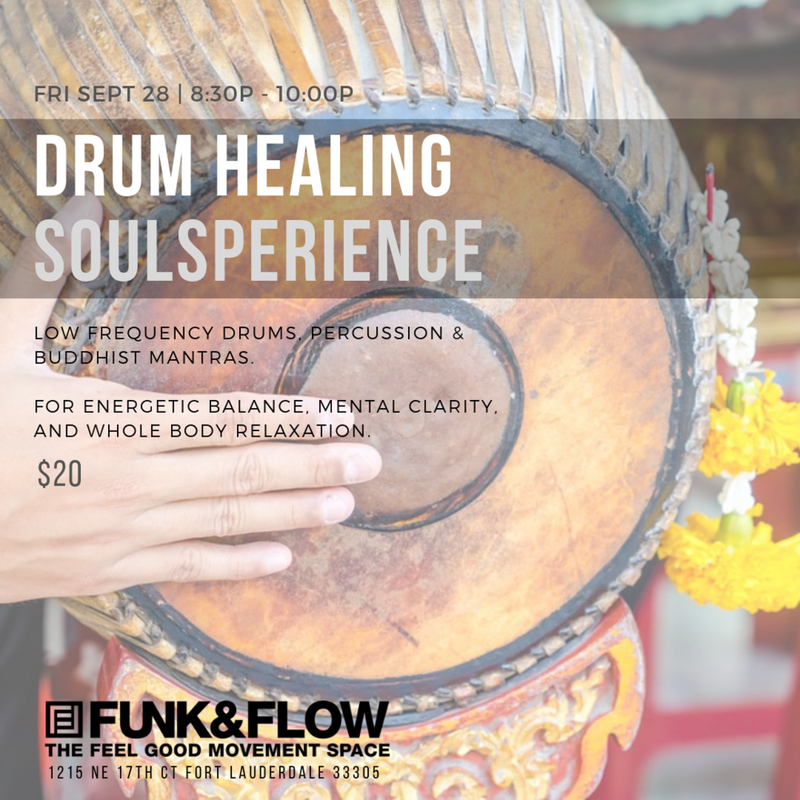 JOIN US for a magical evening of Drum therapy and Dance freedom set to the creative energy of the Full Moon. Professional Percussionist Alan Reyna will guide the drum circle from 7:30-8:30, 8:30-9:00 is an open dance floor (should you feel the Boogie). Come to Jam. Come to Connect. Come to FEEL GOOD. This event is open to everyone, of all skill levels. You are welcome to BYODRUM however DRUMS WILL BE PROVIDED FOR ALL. Registration in advance in recommended, as we require 10 people minimum to hold this event, capped at 40. Yoga Only 6-7P $15 (early/at door) or Famship/Class Bundle* FAMships can sign up online for Full Moon Yoga, Class Bundle holders please sign up in studio. Feeling like you're ready for more, but you don't know what more is? Do you know where you want to go but not clear on your path? 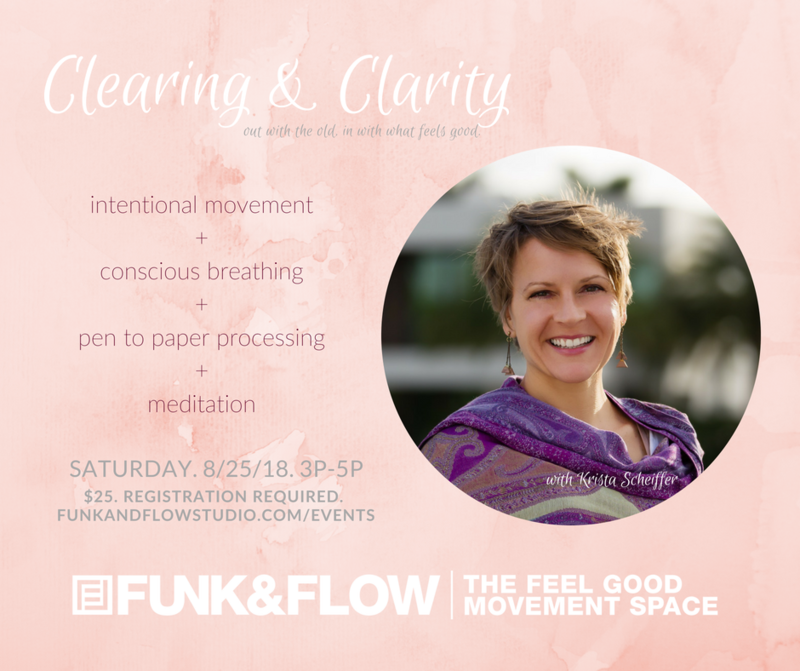 This two hour workshop fuses movement, breath, writing and meditation to clear out sticky confusion and catapult us in our desired direction. Krista has been working with clients on their mind body connection since 2009. Despite life's wild turns, Krista returns to the yoga path and the study of the self through movement and breath. Krista is of the firm belief that in the self we discover all of our answers. Purchase a Single, Swing Set or Couples Swing Set. Visit LINEUP and sign-in to your class of choice (Intro or Level One). Jamey Kahl received her 200 RYT from Asheville Yoga Center in March 2017. She is dedicated to educating students about holistic modalities which can be implemented to achieve personal wellness and healing. Have you ever wondered how the chakra system relates to our physical, emotional, and spiritual wellness? Join Jamey and (y)our community for an in-depth yoga series dedicated to understanding and activating your energetic body. The seven energy centers of the body correlate with our physical, mental, and spiritual body and activate through breath, movement, and meditation. Each class will explore the meanings and functions behind each chakra, which promote a well-rounded asana practice with better understanding about the way our body functions. Workshop includes discussion, asana practice, and chakra crystal set. Participants are welcome to join for the entire series, or an individual class. Join Hip-Hop instructors + movement lovers Jessi Morris & Adam Anthony for the ultimate cardio dance jam. FUNKSHOP is a combo of our cardioFUNK + HIP HOP 4ALL. We'll break it down, sweat it out, and move from our hearts. Class is part follow-along grooves and part hip hop choreography - taught to the beat - so we keep the juices flowin! This JAM is for our community of former, current, and wanna-be dancers. If you hate to workout but love to dance, or love them both, we'll see you on the dance floor. Calling all KIDS! Via parents surfing the web, of course. 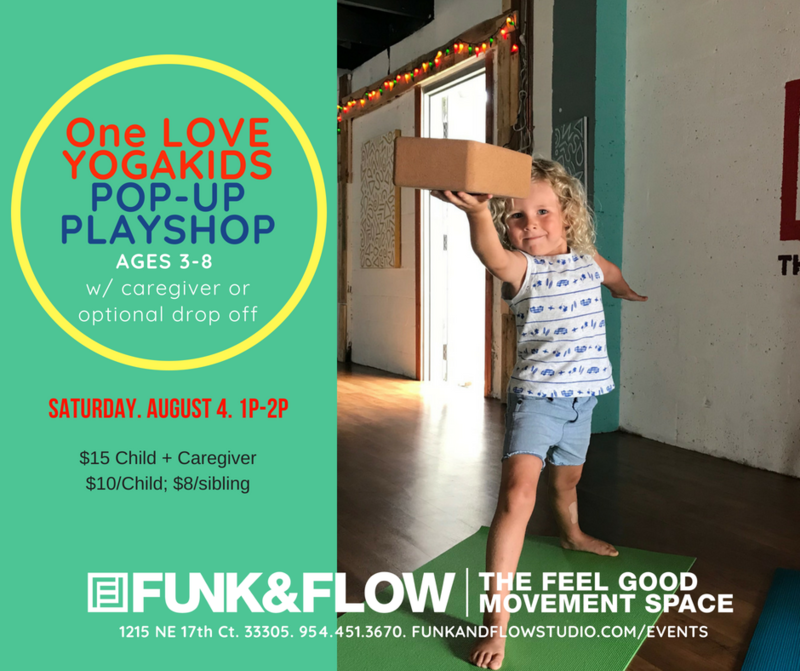 Kids will enjoy a fun workshop encouraging self-expression through yoga, movement, and play. Children will learn ways to strengthen their inner and outer bodies by improving strength, flexibility, balance, and coordination, while learning to focus through breathing and relaxation techniques. This "play-shop" will end with a fun arts and crafts the kids will get to take home and share with their families, and the kitchen refrigerator! FUNKMOB takes to the streets on behalf of the Old Dixie Hwy Ribbon Cutting Ceremony, happening June 3rd, between 3-5P. reading this after 5/12? no biggie. you can still join us for rehearsals!